Yeah! After almost 5 years I have finally finished my first font. I will call it Phelix Boomgartner. It's italic display font ideal for something crazy. 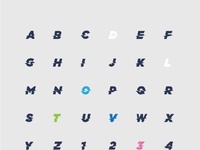 It's only uppercase but it's available for FREE as OTF, TTF and also vector file.